A synergistic blend of herbs used as a nourishing & reconditioning natural facial cream. 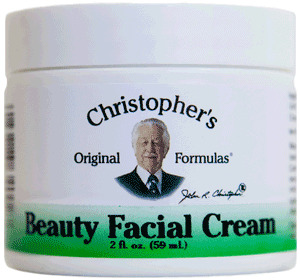 Dr. Christopher's Beauty Facial Cream Ointment complements the skin & has been historically used for wrinkles, to smooth and soften chafed, chapped & dry skin. Ingredients: Extra Virgin Olive Oil, Aloe Vera Gel, Vitamin E Oil, White Oak Bark, Comfrey Root, Marshmallow Root, Mullein Leaf, Black Walnut Leaf, Gravel Root, Wormwood Herb, Lobelia Herb, Skullcap Herb & Gardenia Oil. Directions: Apply externally at least six times a day or as needed. External Use Only. Refrigerate for long term preservation.